Encouraging proper eating habits is not an easy task in this world of fast foods and run-out-the-door meals. Study nutrition with these activities and help your preschoolers become aware of how food influences their everyday lives. These crafts are fun to make and will teach concepts of healthy eating using art projects that hopefully will open a discussion at home. As the children begin to study the new My Plate, they will see colorful shapes representing six categories of food on a plate. Good food gives our bodies the nutrients we need for growth, energy, and good health. Children need to realize that they need to eat a balanced diet of foods from each group. 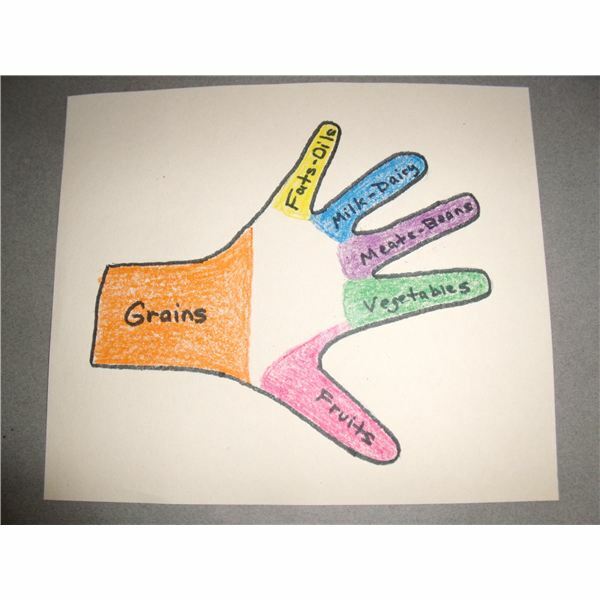 Here is a hand-y craft for the preschoolers to make and take home as a reminder of the food groups, and a good way to start a discussion on healthy foods at home. Have an adult trace around the child’s hand in the middle of a sheet of white paper. The teacher can take a black marker and write the food groups on each finger and top of the hand. This can be done with each child, or if you have a large class, a pre-drawn hand labeled with the food groups can be made and photocopied. Have the children color each finger and upper hand according to the food pyramid colors for each food group. Pizza is a healthy food, loaded with tomato sauce, vegetables, cheese, and spices. Kids love pizza, so make a paper replica to show the children how several of the food groups are combined in this tasty pie. 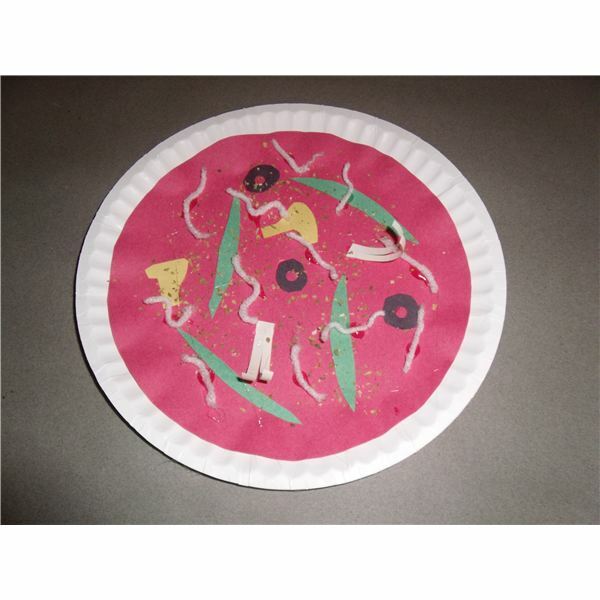 Help the children put the red tomato sauce onto their paper plate, using either a red circle of construction paper glued to the plate, red paint, marker or crayon. Ask them to think of healthy foods that can go on pizzas. Invite them to cut out these foods from scraps of construction paper. Think about veggies like green pepper strips, mushrooms, olives, broccoli flowerets, onions, spinach leaves, and so on. Glue these randomly on the pizza. Cut the yarn into small pieces and glue this all over the pizza to represent the shredded mozzarella cheese. While the glue is still wet from gluing on the cheese, sprinkle on a little dried oregano so the project will smell like a pizza. This activity helps children learn to make choices, between healthy foods and junk foods. The teacher can make templates of a body shape on cardboard. Children can now trace around the template on white or brown paper and cut out this shape. Provide time for the preschoolers to look through magazines and cut out pictures of their favorite foods; hopefully, these will be healthy choices. Invite the children to glue these pictures onto the body template. These activities are perfect for starting a discussion on good foods with your class. We know that children have favorite foods, but they may not be healthy for the body. These nutrition crafts may be an excellent method for young children to learn about healthy choices. A simple study of nutrition to promote healthy eating habits is important for preschool children.Teach them to make healthy choices. Help your group become aware of how food influences their everyday lives with these articles.